Venom joins the Secret Avengers ... but what's left of Flash Thompson to join the team? Then, Eddie Brock, the original Venom, returns - and he's gunning for symbiotes! Plus: a routine super villain prisoner transfer thrusts Flash into a dire conflict. One fatal act will change the new Venom's life forever! 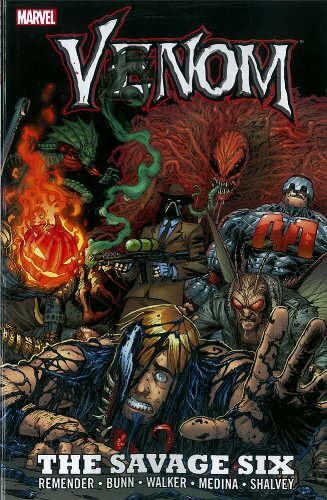 Finally, the Crime-Master unites Jack O'Lantern, The Human Fly, Toxin and more to destroy Venom! The villain's plan is so diabolical, it forces Eddie Brock to become a symbiote's host once more - and takes the war to the people closest to Flash Thompson! Rick Remender is the writer/creator of comics such as Fear Agent, The End League, Strange Girl, Black Heart Billy, Last Days of American Crime, Sea of Red, Sorrow, Night Mary, XXXombies and Doll and Creature. He is also the writer of Marvel's X-Force, Punisher and Doctor Voodoo. Outside of comics he has served as a writer on the Electronic Arts hit game Dead Space and is currently lead writer on EA/EPIC/PCF's Bulletstorm game. Prior to this, Remender served as an animator on films such as The Iron Giant, Anastasia, Titan A.E., and Rocky and Bullwinkle.